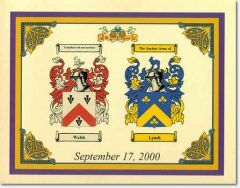 A Full colour print of the Two Coats of Arms most commonly associated with your family’s surname, displayed in our ‘Gothic’ theme, each from a distinct family, symbolically joined on one page. These items have been carefully researched using the most recognized historical sources. To research your family name origin, surname history, genealogy or heraldry , please use the search.